In The American Cinema: Directors and Directions, 1929-1968, Andrew Sarris singles out one film by Frank Borzage as being exemplary of “moral of the auteur theory”. Yet, as Sarris states in his most recent overview of American talking cinema, “Borzage remains an elusive figure in film history.” (2) And Moonrise (1948), one might add, remains a particularly elusive movie in film history. Its pictorial lyricism and subdued pathos harked back to the æsthetics and tone of 1920s silent cinema and, as some scathing reviews indicate (3), were entirely out of tune with current tastes, when the film was released in September 1948. 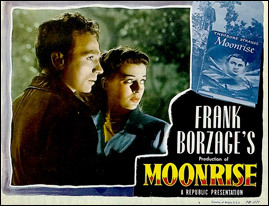 Although Moonrise has since come to be regarded as Borzage’s last masterpiece, its low-key gravitas and complete lack of irony have remained unfashionable. No wonder the movie is far less renowned than, say, Charles Laughton’s Night of the Hunter (1955), which might be film history’s only other charming oddity that lends itself to comparison. That film was also stylistically anachronistic and it suffered audience neglect upon release, but its self-conscious flamboyance has since endeared it to postmodern sensibilities. Borzage’s disarming earnestness, on the other hand, makes a bemused perception of his film as some quaint, though hauntingly beautiful, pastiche virtually impossible. The film is indeed a variation on the filmmaker’s main theme, featuring numerous motifs characteristic of his œuvre. Hence, one might regard it, as David Kehr does, as “the summing-up and reaffirmation of past work, the final statement, or testament, of a man who has actually spent his life making one picture” (5). What has been ignored, though, is the fact that, whereas the mise en scène departs from the style that this auteur is mainly associated with, the film derives its Borzagean themes and motifs virtually unchanged from its long-forgotten literary source of the same title. The ignorance of that novel by Theodore Strauss, a former The New York Times film critic, who had recently become a screenwriter, has blinded critics and scholars against some of the subtleties of this “moral of the auteur theory”. As a result, the production values seem modest compared to major studio productions of the time, but they made the black-white-film stand out conspicuously amongst those Westerns, which Republic churned out as its main staple on budgets of roughly $50,000. Clocking in at a final production cost of $849,452, Moonrise was one of the few so-called “Premiere” productions, which the minor studio, in a new strategy, designated for the first-run market. (9) Yet, the movie flopped, just as Republic’s upscale strategy proved to be generally ill-fated. Borzage’s film, ultimately, turned out to represent a dead-end amongst Hollywood’s modes of production. 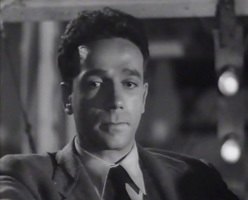 The protagonist is introduced as a typical film noir character who is twice a victim of circumstances. Five minutes into Moonrise, Daniel “Danny” Hawkins (Dane Clark) inadvertently kills his lifelong foe, Jerry Sykes (Lloyd Bridges), in a fight and henceforth fears arrest. That fear goes hand in hand with an idée fixe of having inherited “killer blood”, since, as his fellow citizens have never ceased to remind Danny, his father had been hanged for murder. The first sequence evokes that backstory through a nightmarish montage, which is an example of virtuoso filmmaking and, at the same time, functions as an highly economic exposition. The sequence’s flamboyant expressionism remains an exception, though, even if director of photography John Russell repeatedly employs dramatic low-key lighting throughout the film. Henceforth, the story is told mainly from the paranoid perspective of the protagonist, reminiscent of such film noirs as William Dieterle’s The Accused (1949) and Fritz Lang’s The Woman in the Window (1944), whose protagonists also fear arrest for murder. Unmistakably Borzagean, though, is the love story at the heart of Moonrise, which is a variation on the filmmaker’s main theme: “The positive optimism of Borzage’s work as a whole rests on a deeply felt belief in the redemptive quality of love”, writes Belton. Like Jean Arthur (in History Was Made at Night, 1937), Joan Crawford (in The Shining Hour, 1938, and Mannequin, 1937) and Margaret Sullavan (in The Mortal Storm, 1940), Gail Russell plays one of those Borzage women, who only meet their perfect match when already married or engaged to someone else. What makes this schoolteacher’s case even more complicated is that Gilly Johnson’s fiancé has disappeared on the evening of their engagement. And the one, with whom she falls in love the very next day, is none other than the man responsible for her fiancé’s death. Unlike the main female character, however, Danny does not fit the description of Borzage’s romantic protagonists, whose “physical beauty”, according to Dumont, “is the irradiation of the spiritual energy lying dormant within them, waiting to be awakened” (16). Dane Clark is hardly radiantly beautiful and his character’s spiritual energy is hidden deeper than any other Borzage character’s. Hence, Danny might indeed be “the most overtly neurotic character in any Borzage film”, as Robert E. Smith claims. (17) Right after he has killed Jerry, who had started the fatal fight by telling him to keep away from Gilly, Danny rudely coerces the schoolteacher to dance with him. Shortly thereafter, he almost gets himself as well as Gilly and another couple killed, when he speeds like a maniac on his ride home. Like many of Borzage’s lovers, Danny has childlike qualities, though. His actions remind Gilly of one of her pupils; and the film early on establishes a parallel to the mentally retarded, childlike Billy Scripture (Henry Morgan). That the storyline is to be understood as a process of spiritual adolescence is made clear, when the sheriff in the final sequence spares Danny the handcuffs, so that he can walk back to town “like a man”. Only then is the “spiritual energy”, which Borzage’s characters usually emanate, finally awakened within the protagonist of Moonrise. And when this embittered jinx makes peace with his inner demons, it is a fairytale-like happy ending that one would probably not buy from any other filmmaker but Borzage. “It’s wonderful to see your face, Daniel. To really see it”, Gilly says, when both are reunited in that last scene. And these dialogue lines, for which there is no template in Strauss’ novel, suggest an answer to the question that sceptical viewers have to ask themselves: Why should Gilly have fallen in love with this naïve, coarse misfit in the first place? The answer is: In Borzage’s idealist cosmos, love begins with a look that reaches the other’s very spiritual essence – even if that essence is hidden beneath a rough surface. Danny’s surface appearance is not only particularly rough, though, but it also lacks the glamour that, say, Clark Gable (in Strange Cargo, 1940), Spencer Tracy (in Man’s Castle, 1933) and, above all, Charles Farrell (in Seventh Heaven, 1927) and Janet Gaynor (in Street Angel, 1928) bestow upon similar characters. One might speculate on what John Garfield, Alan Ladd, Burt Lancaster or James Stewart – who reportedly had all been considered for this part (18) – might have made of the role. Clark, in any case, perfectly embodies that peculiar combination of immediate sensuality and a somewhat childlike innocence, which is so typical of Borzage’s lovers. An old, vacant plantation mansion serves as the refuge, which is a prerequisite for love in almost all of the director’s films. A “safety zone” is what Trina (Loretta Young) calls such a refuge in Man’s Castle, and, as is so often the case with such special places in Borzage’s cinema, Blackwater Mansion seems to transcend time. “It seems like all the clocks in Virginia stopped at once”, Danny remarks, before Gilly playfully assumes the role of the erstwhile plantation owner, thus defusing the erotically charged situation. Yet, unlike, for example, the refuge in Seventh Heaven, Danny and Gilly’s “safety zone” does not stand the test of the outer world. Instead, their second rendezvous at the mansion is cut short by the sheriff’s search party, which might remind one of Street Angel, where Angela (Janet Gaynor) has to leave Gino (Charles Farrell) and their “safety zone”, because a policeman waits outside for her to turn herself in. The first scene at the Blackwater Mansion is also reminiscent of some minor Borzage works. When the floorboards creak in a ghastly way and when the former owner’s portrait inspires Gilly to imaginarily transpose herself into the past, one is reminded of the first meeting of the couple from Smilin’ Through (1941). When Gilly, upon entering the dark salon, appears as a mere silhouette, the mise en scène seems like a reprise of the only truly Borzagean moment from Stage Door Canteen (1943). The movie repeatedly references visual motifs from the Borzage’s earlier works, though. To give just one more example: when Danny regains consciousness, after having jumped from a Ferris wheel in paranoia, the point-of-view-shot of Gilly’s face entering his field of vision calls similar scenes from A Farewell to Arms (1932) and in The River (1929) to mind. But, for the most part, the mise en scène in Moonrise is strikingly different from the style that had made the director famous. is how Dumont accurately summarizes one element of this auteur’s visual style. (19) With Moonrise, however, quite the opposite is the case. Instead of sfumato, Borzage repeatedly employs the chiaroscuro of noir, and he constantly creates dynamic tension between the protagonist and his environment, between fore- and background. It is, above all, this mise en scène which articulates the despair of an outsider, who fears arrest for murder. Danny’s paranoia is suggested most effectively in the aforementioned scene at a fairground, when, sitting in a Ferris wheel with Gilly, he anxiously looks on as the sheriff, in the background, gets into another carriage. Two scenes, which are choreographed like highly charged pas de deux, suggest that Danny, whom his fellow citizens have always kept at a distance, himself acts either importunately or brusquely towards the people he loves: before Gilly seals their love with a kiss, she tries hard to resist Danny’s rude approaches. As a consequence, both characters’ movements, as well as the camera’s, project a diagonal into the depth of the frame. A similar spatial dynamic is, in effect, in a scene at the house of Danny’s aunt. After Borzage has had his protagonist nervously circle the woman, he positions both at the opposite ends of a diagonal, stressing that Danny, in the foreground, keeps his back turned toward his aunt, until the very moment when, in the background, she has just exited the room. 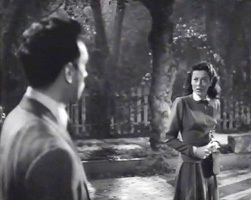 Borzage has his protagonist turn his back to others and avert his gaze during other dialogue scenes, as well. He also regularly positions two characters at an angle of 90 degrees to each other, further stressing their avoidance of eye contact by framing one character in profile. While such a mise en scène contributes to a particularly pictorial storytelling, Borzage repeatedly forgoes any dialogue during the first third of the movie. Instead, he has gestures speak in close-ups. During the opening sequence, words only function to identify Danny and Jerry at young age. Kent Jones has probably that opening montage in mind, when he vaguely refers to the “neo-primitive expressionism” of the film. His question, “Moonrise […] may be a throwback, but to what?” (20), is easily answered, though. The morbid shadowplay of that particular sequence appears to be modeled after the silhouettes which entrap Angela in the prison scenes of Street Angel. One might as well feel reminded of the expressionistic montage, which in A Farewell to Arms suggests the flight of Lieutenant Henry (Gary Cooper) through Switzerland. And, more generally speaking, Borzage obviously used this film as an opportunity to hark back to his artistic prime during the silent years. With Moonrise, Borzage probably came as close to invoking some of silent cinema’s æsthetics as was possible in 1948. However, Muller overstates the case, when he claims, “With title cards replacing its dialogue, it could have been the greatest silent picture Borzage ever made.” (23) Not only does that statement neglect the director’s silent masterpieces, above all Seventh Heaven and Street Angel, it also neglects the special charm of the dialogues in Moonrise. Repeatedly, the sheriff and Mose get the opportunity for long verbal digressions, which would merit to be quoted in whole, if they were not so copious. “If you went into all the reasons why that rock struck Jerry’s head, you might end up writin’ the history of the world”, the sheriff tellingly summarizes one of his own monologues. Pa had it pretty rough. After I was born Ma … Ma took sick at night. Doctor said it was too far to come. Gave Pa a bottle of pills. She died the next day. Pa carried me to Grandma’s cabin and came into town. Shot the doctor. Shot him dead. Took three bullets to kill him. Took ’em three weeks to hang Pa. These cadences seem to have been modelled after the succinct poetry of a blues song, and in a pivotal scene it is a blues song, indeed, that replaces conventional dialogue. Sarris might be right, when he states, “we do not think of great Borzage movies so much as great Borzage moments. These moments usually culminate in an intense expression between two people.” (24) As examples he, of course, cites the director’s great love couples, among them Gilly and Danny. But to those ‘great Borzage moments’ one has to add the nocturnal scene, in which Mose, by singing a blues about a man sentenced to death, communicates to his friend that he knows of his guilt. It is the film’s quietest scene, with hardly any motion within the frames. Danny, who otherwise mostly appears agitated, lies still in the grass. His posture might have been modelled after another ‘great Borzage moment’ from Strange Cargo, where Julie (Joan Crawford) lies in a small boat, on board of which she, together with André (Clark Gable) and others, has escaped from a prison island. Totally exhausted, she suddenly finds peace of soul and confesses her most intimate thoughts to a mysterious Christ-like character. In Moonrise, Danny reveals his greatest secret, when he affirms Mose’s suspicion. Yet, Borzage stresses the scene’s quite sadness by contrasting the silent accord between both men with a dynamic tension between foreground and background. In a medium long-shot, we see Danny in the background lying at the edge of the swamp, while Mose in the foreground sits on the porch of his cabin. By alternating close-ups of each men, Borzage emphasizes the distance between them – the more so, as Mose apparently does not have the heart to look his friend in the eye. Framed in close-up, slightly from below and almost in profile, Mose stares off-screen, without ever turning his head to Danny. The beauty of this mise en scène, which accentuates the emotional charge of the situation, can certainly be attributed to the director, even if it is strikingly different from the style he is mainly associated with. But apart from the mise en scène, this scene has been transposed virtually unchanged form the literary source. The same applies to almost every single of the film’s dialogues, while the slight changes to the plot have resulted primarily in tightening it. Thus, when Rose Capp states “Haas’ screenplay is one of the many pleasures of Moonrise”, citing “his ear for the Southern vernacular and well-observed character ironies” (25), credit is actually due to Strauss. He had originally been designated to write the script together with one Frank Paret, when Paramount purchased the rights to his story. Later, various other screenwriters were reported as dramatizing the novel. (26) In the end, producer Haas received screenwriting credit, the only one of his career. While Borzage’s work has lately been the object of a modest revival, Strauss has been completely forgotten. (27) That is a pity, because his earnestness in dealing with a poor man’s Crime-and-Punishment-theme is, like Borzage’s, totally disarming, even if his tone tends to be as grave as one might assume from Mose’s and the sheriff’s dialogues. Strauss’ book featured prominently in the publicity campaign for the film, and was displayed on posters and lobby cards. Film reviewers regularly referred to Moonrise’s literary source and The New York Times even opened its review of the film stating, “The ancient argument as to which medium tells the story best, written words or pictorial images, is again brought into focus by Moonrise.” And the reviewer actually thought that “the book towers above the picture” (28). 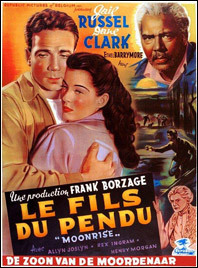 However, the novel – as well as the film – had apparently been already forgotten, when in 1951 it was published as a paperback, since Bantam re-titled it Dark Hunger. When Joe McElhaney applies the quintessence of these words – obviously unaware of their origin with Strauss’ novel – onto Borzage’s whole œuvre (31), he acts overhasty, to say the least. But this particular outlook on the human condition and the world is not only affirmed by the narrative of Moonrise, it is also underscored by Mose’s last words. Addressing one of his dogs as “Mister Dog”, Mose states: “If a man knows how to rejoin the human race, once he’s resigned, it helps, Mr. Dog, it helps.” Tellingly, these are among the few words in this movie which do not originate with Strauss. That Borzage’s film thus, paradoxically, attests to Strauss’ outlook on the human condition by a rare divergence from his book, might offer an ironic moral of sorts for auteurists, too. Andrew Sarris, The American Cinema: Directors and Directions, 1929-1968 (New York: Da Capo, 1996), p. 86. Andrew Sarris, You Ain’t Heard Nothing Yet. The American Talking Film, History and Memory: 1927-1949 (New York, Oxford: Oxford University Press, 1998) p. 361. John Belton, Hollywood Professionals, Vol. 3: Howard Hawks, Frank Borzage, Edgar G. Ulmer, (New York: A. S. Barnes & Co.; London: The Tantivy Press, 1974), p. 112. Dave Kehr, “Moonrise”, Focus! Chicago’s Film Journal, No. 9, Spring 1973, pp. 26-30, p. 26. Edwin Schallert, “Producers Buy ‘Wild’ Both in Plays, Books”, Los Angeles Times, 3 December 1945, p. 9. Thomas F. Brady, “Old Order Changes”, The New York Times, 8 February 1948, p. X5. John L. Scott, “Film Makers Cut Costs to Meet New Conditions”, Los Angeles Times, 18 January 1948, p. D1. Cf. Todd McCarthy and Charles Flynn, “The Economic Imperative: Why Was the B-Movie Necessary?”, in Todd and Flynn (Eds), Kings Of the Bs (New York: Dutton, 1975), pp. 13-43, p. 25f. Eddie Muller, Dark City: The Lost World of Film Noir (New York: St Martin’s Press, 1998), p. 190. Quoted in Thomas Cripps, Making Movies Black: The Hollywood Message Movie from World War II to the Civil Rights Era (New York, Oxford: Oxford University Press, 1993), p. 207. Theodore Strauss, Moonrise (New York: Viking, 1946), p. 77. Donald Bogle, Blacks in American Film and Television. An Encyclopedia (New York, London: Garland Publishing Inc., 1988), p. 4. Hervé Dumont, Frank Borzage: The Life and Films of a Hollywood Romantic (Jefferson, North Carolina: McFarland & Co., 2006), p. 19. Robert E. Smith, “The Films of Frank Borzage, Part 2”, Bright Lights, No. 3, Summer 1975, pp. 15-22, p. 19. According to the Los Angeles Times’ Edwin Schallert, Garson Kanin “was reported to have [the screen rights to Strauss’ novel] in tow […] for John Garfield. Now, I understand John Farrow put in a bid […], because [Moonrise] looks good for Alan Ladd.” (Edwin Schallert, “Doug to Act ‘Caballero;’ ‘Secret’ Set for Taylor”, Los Angeles Times, 6 November 1946, p. A7.) When Haas and Grant bought the screen rights, they supposedly planned to develop the property “with an eye ‘toward John Garfield or Burt Lancaster’”. (A. H. Weiler, “Random Notes About People and Pictures”, The New York Times, 9 February 1947, p. X5.) The Los Angeles Times, meanwhile, reported that “James Stewart and John Garfield have been among the stars sought, although it is doubtful about Stewart, because of his other commitments.” (Edwin Schallert, “Best-Seller Heroine ‘Lydia Bailey’ Nominee”, Los Angeles Times, 24 February 1947, p. A3.) Garfield became part of the deal that eventually fell through, when the producers failed to get a completion bond. Kent Jones, “The Sanctum Sanctorum of Love”, Film Comment, September-October 1997, pp. 32-43, p. 35. Quoted in Dumont, p. 22. 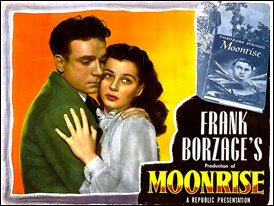 “Borzage Predicts Many Innovations in Camera Techniques and Methods”, Moonrise Exhibitor Manual, CineFiles, the Pacific Film Archive’s Film Document Image Database. Sarris, You Ain’t, p. 364. Rose Capp, “Dead man Walking in Frank Borzage’s Moonrise”, Senses of Cinema (Melbourne Cinématèque Annotations on Film 2004). Born in 1912, Strauss had published a novelette, Night of the Hogwallow, in 1937. He was a reporter and film critic for The New York Times from the late 1930s till 1944, when he became a screenwriter for Paramount, where he eventually received screen credits for four films. From the 1960s till the mid-1980s, he worked in television as a writer and producer. A. W., “Moonrise New Film at the Globe”, The New York Times, 7 March 1949, p. 17. Joe McElhaney, “Frank Borzage: Architect of Ineffable Desires”, Senses of Cinema (Great Directors – A Critical Database). Holger Römers has written on film, photography and pop culture for various German and Austrian newspapers, film and art journals as well as for Cineaste, Film International and Senses of Cinema. Most recently he has contributed an essay to a book anthology on German film history (forthcoming from London’s Wallflower Press). He lives in Washington, DC, and Cologne, Germany.